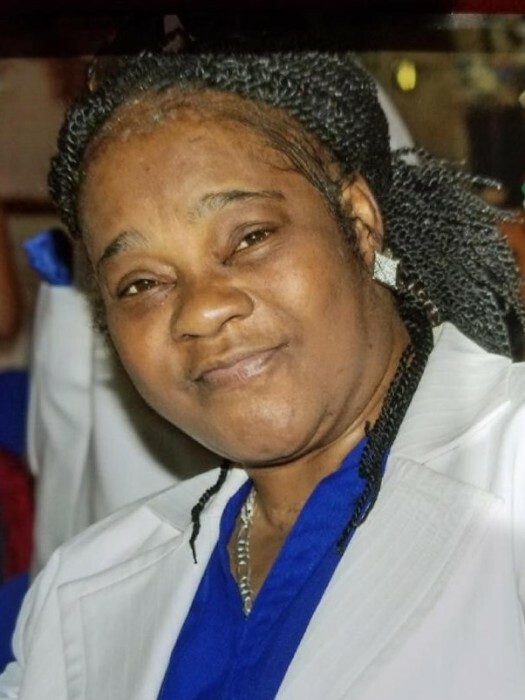 Carrie Lavada Lane 50 of Chicago, IL transitioned on August 23, 2018, in Harvey IL. Carrie Lavada Lane was born to the Late Presiding Bishop James L. Lane and the Late Mother Katherine Lane in Chicago, IL on June 11, 1968. Shortly after, her family moved to Caruthersville, MO where her father began pastoring New Life Deliverance Temple Pentecostal Power Church. At an early age, she was saved and baptized in Jesus’ name under her father’s leadership. She attended and graduated from Caruthersville High School in May 1987. She moved to Chicago, IL the next day and became a member of True Church of Christ Divine at 7208 South Ashland Avenue under the leadership of Bishop Fredrick Mitchell. In the church, she was an active musician, playing both the guitar and drums. She loved writing songs and singing. Two of her favorites were “Walk Around Heaven All Day” and “God Specializes”. Nineteen years later, she moved her membership to Deliverance Kingdom Church of Chicago, IL. Throughout her church life, she had a long-lasting ministry working with the young people. She became a strong youth leader. She always had a joyful attitude and enjoyed making people laugh, on many occasions she would emulate her father in preaching. One of her most memorable qualities was the love that she had for her family. She would just call to say hi, or just because she wanted to hear your voice and NEVER ended a call without saying “I love you”. She would constantly remind her sisters that she was the oldest girl and say “you better listen”. She departed this life on Thursday, August 23, 2018, at 6:37 pm at Ingalls Memorial Hospital in Chicago, IL. She was preceded in death by her father Presiding Bishop James L. Lane, her mother Katherine Lane, her sisters Doris and Brenda, and her brother James Lane. The memory of Carrie Lavada Lane will be left with her mother Rose Lavada Lane of Caruthersville, MO, her siblings Bishop Leroy (Denise) Lane and LaTonya Michelle Lane of Benton Harbor, MI, Elder John (Clara) Lane of Caruthersville, MO, Calvin Lane of Atlanta, GA, Hope Harriet (Paul) Miller of Cape Girardeau, MO, Evangeletta (Bruce) Ricks of South Bend, IN, Alexander Slaughter of Tampa, FL, Eldered Slaughter, Roberto Slaughter, Antonio Slaughter, Delangelo Slaughter all of Jonesboro, AR, Terrance (Ariel) Slaughter of Dyersberg, TN, Emmanuel Lane of Dover, TN, and Riley Dewayne Lane of Caruthersville, MO. Uncles and Aunt’s; Josephine (Tommy) Wallace of St. Louis, MO, Willie (Mattie) Lane of Cleveland, MS, Scot Lane, and Robert Lee Lane both of Akron, OH, Frankie Lane of Cordova, TN, Mammie Brown, and Irma Jean (Derick) Bauchannan, both of Akron, OH, Rufus (Inez) Harris of Detroit, MI, Sid Harris, G.T. Coleman, Rosemary Harris, Mary (Sam) Thompson, May Frances (Reggie) Owens, and May Ran Coleman all of Chicago, IL. God-mother Melinda Russell of Kenneth, MO, Special God-daughter Keara Nelson of Chicago, IL. Special friends; Darlene (Anthony) McAfee-Washington, Charletta Maxberry, Best-friend Audrey Wynne, and Special nurse Angie McAfee all of Chicago, IL. A host of nieces, nephews, cousins, and friends. Legacy farewell services will be held on August 31, 2018, at Straight Gate Pentecostal Power Church located at 466 Pipestone Road, Benton Harbor, MI 49022 with visitation starting at 10:00 am followed by services at 11:00 am.